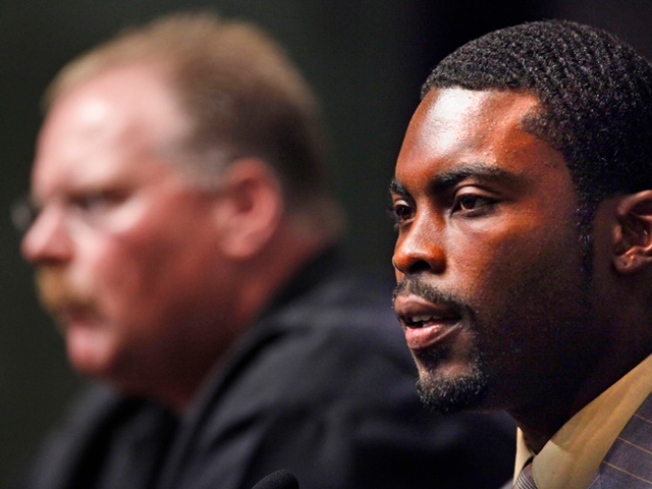 Michael Vick is along with seen Philadelphia Eagles head coach Andy Reid during a news conference in Philadelphia. Second chances were the theme as the Eagles introduced Michael Vick to Philadelphia and reintroduced the sports world to one of the most controversial stars in football history. Vick was in Philadelphia looking for a second chance and a fresh start with the Birds and knows that fans won't easily forgive his actions. “I know I've done some terrible things, made a horrible mistake. Now I want to be part of the solution and not the problem,'' Vick said Friday, referring to his conviction for his role in running a dogfighting ring. Vick was introduced at a press conference Friday morning after signing a one-year deal with an option for a second year with the Eagles. The press room was packed and NBC Philadelphia’s Jade McCarthy counted about a dozen satellite/live trucks outside the Eagles Novacare Complex as both the local and national media swarmed to get the latest on the controversial QB. Eagles coach Andy Reid and mentor Tony Dungy flanked Vick during the presser. The 29-year-old Vick hasn't taken a snap in the NFL since 2006. The former Atlanta Falcons star served 18 months of a 23-month sentence in federal prison. The NFL also suspended him indefinitely. He felt remorse even as he was involved in dogfighting, said the former No. 1 pick. The QB thanked Reid and Eagles ownership for taking a gamble on him. He also personally thanked starting QB Donovan McNabb for lobbying the team on his behalf. The Eagles head coach could relate to the second-chance theme. His own sons faced criminal problems and have tried to return to society. This was something Eagles owner Jeffrey Lurie also mentioned when he addressed reporters after the press conference. “This took a lot of soul searching for me,” said Lurie about his decision to sign Vick. Part of the deal assumes that Vick must do his best to help diminish animal cruelty, said Lurie. Reid said he hopes fans will trust that the team did its homework on Vick and signed him because the team believes the quarterback is a changed man who is ready to return to football. Commissioner Roger Goodell conditionally lifted Vick's suspension on July 27, allowing him to sign with a team, practice and play in the last two preseason games. Once the season begins, Vick can participate in all team activities except games, and Goodell said he would consider Vick for full reinstatement by Week 6 (Oct. 18 at Oakland) at the latest. Vick, who said he has no more pets, said he planned to actively work in the community and the humane society to prove he can help more animals than he's hurt. Vick will practice with the Eagles on Saturday. “I'm ready to go,'' he said.